OUR Workhouse was built in 1726, towards which we borrowed 560l. pulled down 3 Houses, and an old Barn belonging to the Parish, and bought another House adjoining, so that the Parish laid out about 840l. before they could accomplish it; the Consequence of which	has been that we have saved near 200l. per Annum, for by looking, back on the Parish Books, we find that the Charge of the Poor, &c. for 22 Years past, has been, communibus Annis,	at the rate of 570l. per Annum, and since the Workhouse has been built, about 380l, per Annum, and by keeping on the Assessments as they were made several Years before the Workhouse was built, we have been enabled not only to pay all the Money we borrowed, but the rest of our Expences on the Building; and a large Balance being in the Officers hand last Year, we have made our Assessment for this Year at half the Rate it used to be. AT the first opening of the House, there were Trustees or Governors chosen to inspect the Management of it; who lived in the Town near the Workhouse, but these Gentlemen were rarely willing to take the Trouble upon them, by reason of the small Share they paid towards the Support of it, in comparison to what the Farmers do; and therefore the Management has been chiefly in the Hands of the Officers, who are generally the most substantial Farmers ; and they having had the Happiness to choose a good Master, they depend on his Conduct, who keeps the Accounts very well, and following the Orders prescribed for the Diet and Government of the House, there have been few Complaints, the Shopkeepers and Butchers generally having their Turns in serving the House. THE Number in Family has been sometimes 45 and 46, but are now about 40, near half of whom are old People. THE Children are employ'd in Spinning and Knitting, and have not only spun what has been necessary for their own wear, and for supplying the House, but for furnishing some necessitous People out of the House, where the Officers have judged it necessary. They are likewise taught to read by such of the Women of the House, as are most capable; the Master bears them say the Catechism, and reads Prayers to them twice every Day. Eight Children have been put out to Apprentiships, and four to Services. A parliamentary report of 1777 recorded parish workhouses in operation in Tonbridge (for up to 130 inmates), Brenchley (60), Bidborough (6), Hadlow (16), Horsmonden (20), and Speldhurst (30). Kent: Ashurst, Bidborough, Brenchley, Capel, Hadlow, Horsemonden, Pembury, Speldhurst, Tonbridge (2), Tudeley. The population falling within the Union at the 1831 census had been 12,816 — ranging from Ashurst (population 206) to Tonbridge itself (10,380). The average annual poor-rate expenditure for the period 1833-35 had been £18,623 or £17s.7d. per head of the population. The new Tonbridge Board of Guardians held their inaugural meeting on 7th November, 1835, at the then parish workhouse in Tonbridge. John Scoones of Swan Lane, Tonbridge, was appointed Union clerk at a salary of £80 per annum. At a subsequent meeting on the 14th November, it was decided to build a new Union workhouse capable of accommodating 500 inmates. Initially, a site in the area known as "Bo-Peep" in Pembury was considered. This was on land owned by Marquis Camden, but his asking price of £350 was considered too expensive. Instead, in February 1836, a two-acre site at Sandhill, Newbars Wood, was purchased from James Alexander for the sum of £100. 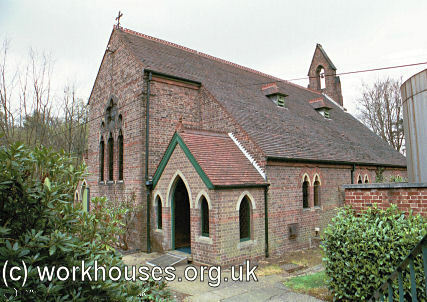 The new building, now to accommodate 400, was designed by John Whichcord, who was also responsible for the workhouses at Cranbrook, Dartford, and Malling. He also adapted Sir Francis Head's model courtyard plan for use at East Ashford and Maidstone. The building work was undertaken by local builder George Cole whose tender was for £4,152. 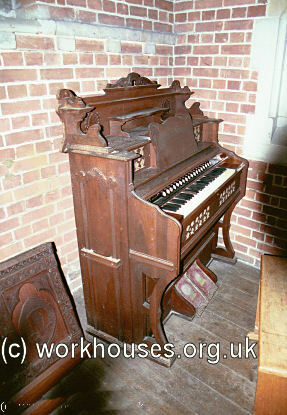 Unskilled labour for the work was provided by inmates from the soon-to-be-replaced parish workhouses in the Union. The new building was completed in December 1836. The workhouse location and layout can be seen on the 1894 map below. The original workhouse building had a two storey front block which originally had a central entrance archway which can still be seen at the rear. Additions were later made to the centre of the front of the building, including a Guardians' board room. Tonbridge front block from the south, 2001. To the rear stood the main three storey accommodation block. In between the front and main blocks, utility buildings were aligned at an angle to divide the space up into five yards for different classes of inmates. 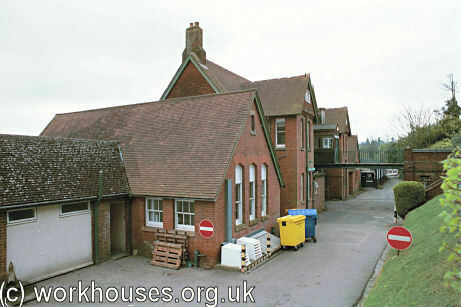 Tonbridge accommodation block and utility buildings from the south, 2001. 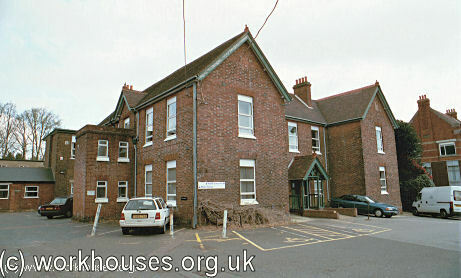 A hospital block, later used a nurses' home, was built at the north of the workhouse in 1856. 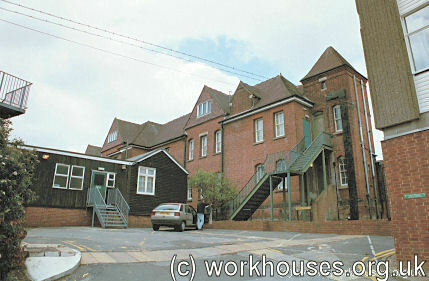 Tonbridge 1856 hospital block, 2001. 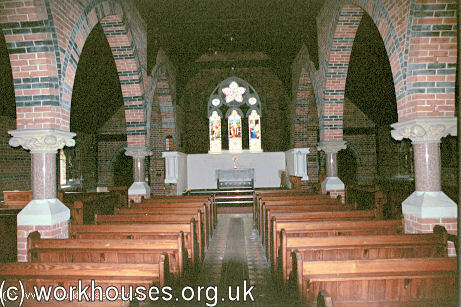 A chapel was erected at the north-west of the site in 1870. This had two entrance porches, one for men and one for women. Also in 1870, a schools block was erected at the east of the site. In 1872, a new entrance block was later built on sloping ground to the south of the workhouse. This contained the labour-master's office and bedroom at its centre, with six sleeping and labour cells at each side. A stone-breaking yard may have stood to the south. Tonbridge new entrance/vagrants block from the north-east, 2001. A larger infirmary was added to the east of the earlier hospital block in 1890. An entrance lodge was also added at the south of the site. 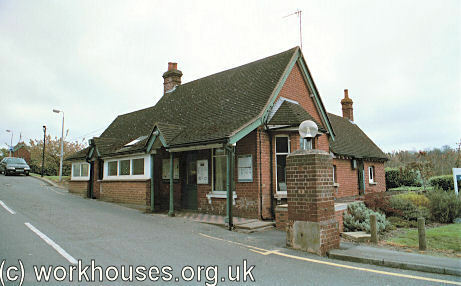 Tonbridge entrance lodge from the west, 2001. The enlarged buildings are shown on the 1909 map below. An overall impression of the site is given by a distant view of the site, probably dating from the early 1900s. Tonbridge viewed from the south, early 1900s. A detail of the scene shows the twelve labour cells with their outlets for broken stone. The foreground shows the land at the south of the workhouse where vegetables were cultivated by the workhouse inmates. A 1986 article by DC Nicholson, Deputy Administrator, chronicled some events from the workhouse's history based on research by Dr TS Leedham. The first Governor of the workhouse, George Gittins, died in January 1837. His temporary successor, Thomas Hadley, received £1.5s. per week plus accommodation. In June 1837, ex-Grenadier Guardsman Sergeant John Harrison and his wife were appointed as Governor and Matron at a combined salary of £80 per annum, plus accommodation. However, within two months Harrison had resigned after being disciplined for drunkenness. He was succeeded by Sergeant W Blyth of the Coldstream Guards and his wife. In the winter of 1837-8, a smallpox epidemic spread through the workhouse, resulting in the building of an isolation block (location unknown) at a cost of £600. In 1850, it was decided that the workhouse should keep pigs. In 1856, a further 12 acres of land to be used for farming were purchased from Sir Isaac Goldsmidt of Summerhill. Bacon and farm produce could be used in the workhouse with any surplus being sold locally. In 1894, the British Medical Journal set up a "commission" to investigate conditions in provincial workhouses and their infirmaries. 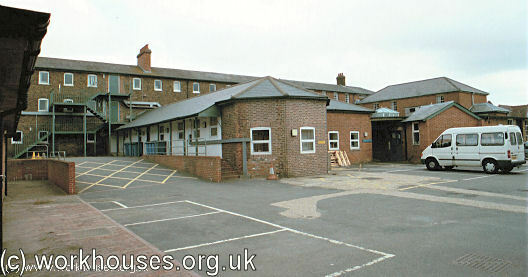 Following a visit to Tonbridge, the commission's report noted that sick were accommodated in three different buildings: the old (1856) hospital block, the new (1890) infirmary, and an isolation block. The old hospital block housed infirm male inmates while the 33-bed isolation block was used for venereal cases, "offensive" patients, or for measles and whooping-cough among the children. All other sick inmates were placed in the new infirmary which provided 120 beds and was generally commented upon with satisfaction. What received criticism, however, was the staffing of the establishment — the only fully trained nurse on the premises was a temporarily employed night nurse. 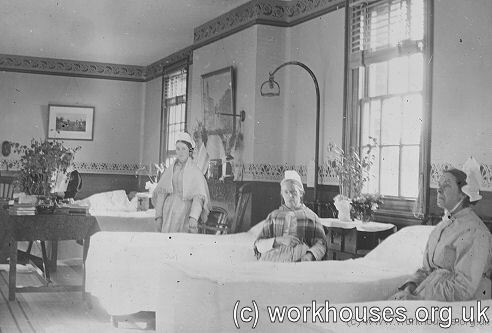 The accommodation for nursing staff was also severely lacking. Further details are available in the full report. The photographs below are believed to have been taken at the time of Queen Victoria's Diamond Jubilee celebrations in 1897. Queen Victoria Jubilee celebrations at Tonbridge workhouse, 1897. Interior pictures from around the same date show a number of the female inmates. 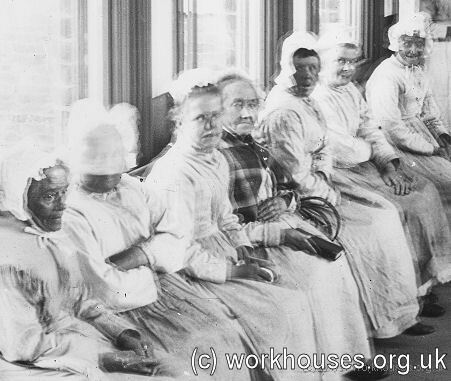 Tonbridge workhouse female inmates, c.1897. Tonbridge workhouse female inmates (detail), c.1897. 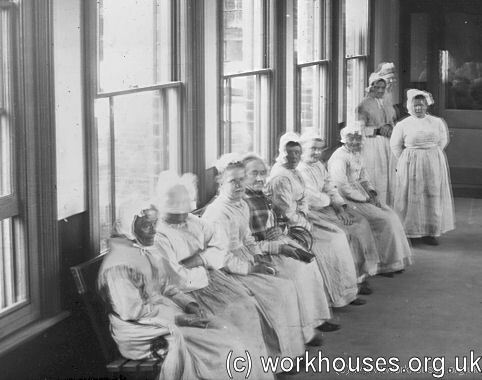 Tonbridge workhouse women's ward, c.1897. 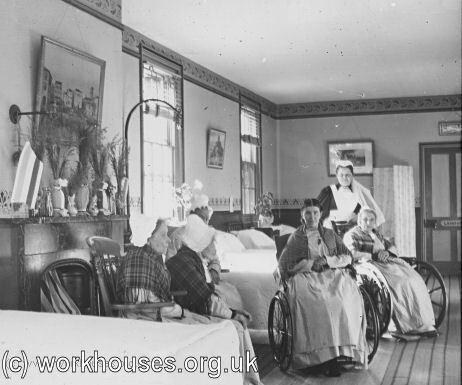 Tonbridge workhouse women's ward, c. 1897. 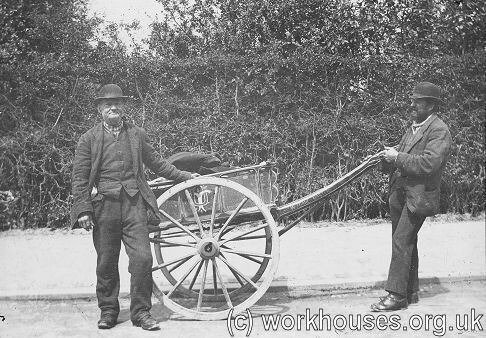 The final picture shows two male inmates, one identified as Billy Brown, with the workhouse cart. 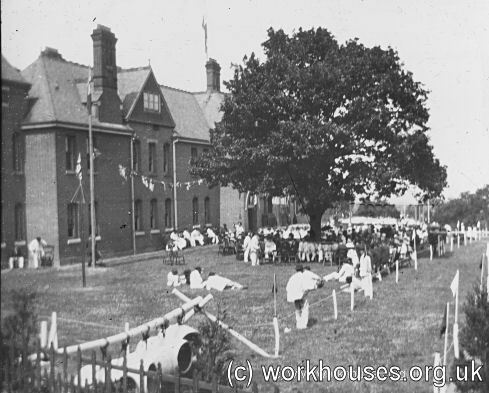 Tonbridge workhouse male inmates, c.1897. 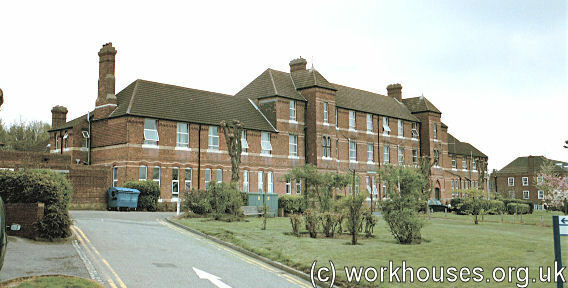 The workhouse became Pembury County Hospital in 1938, later known as Pembury Hospital. All the old buildings, with the exception of the chapel, were demolished in September 2011. 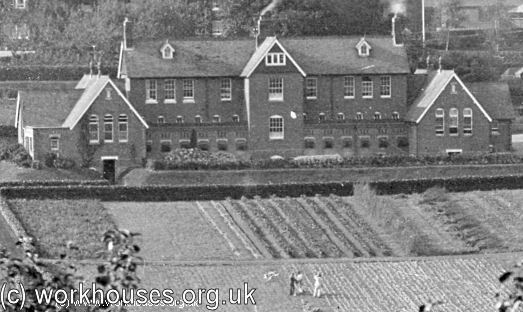 The Tonbridge Union operated two children's homes. 'Silverleigh' at 46 Hill View Road, Rusthall, accommodated up to 13 girls. 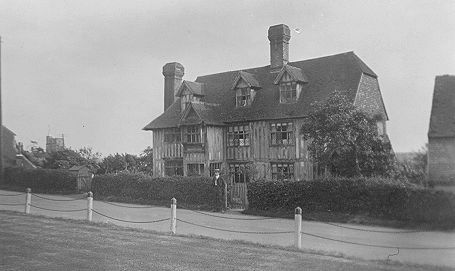 'Chalfont' on Romford Road, Pembury, housed 20 boys. Kent History and Library Centre, James Whatman Way, Maidstone, Kent ME14 1LQ Holdings include: Guardians' minutes (1835-1930); Admissions and discharges (1835-1931); Births (1835-1934); Deaths (1835-1932); Creed registers (1873-1933); etc. Tonbridge Union: 1836-1986 by DC Nicholson in Pembury Contact, No. 802, 8th October 1986.